Rhian Sheehan’s Ambient Music Box Symphony. In a music style built on translucent hues, there are many shades of ambient chamber music. There’s Harold Budd’s minimal austerity and Ludovico Einaudi’s classical melodicism. Ólafur Arnalds trades in glitchy, haunted moods while Kevin Keller charts a more romantic course. But Rhian Sheehan may have created one of the most sublime shadings on his 7th album, Stories from Elsewhere. It’s a magical CD of soaring strings, surging rhythms, childlike music boxes and ambient expanses that sounds both familiar and timeless. New Zealand artist Rhian Sheehan started out as an acoustic guitarist and he was good enough to jam with finger-style guitar icon, Tommy Emmanuel. But he began releasing albums of electronic music in 2001, and more recently, he has emerged with a sound that brings guitars, synthesizers, music boxes and orchestras together into tightly honed, but melodically sweeping compositions. That sound was first evident on his album, Standing in Silence four years ago. 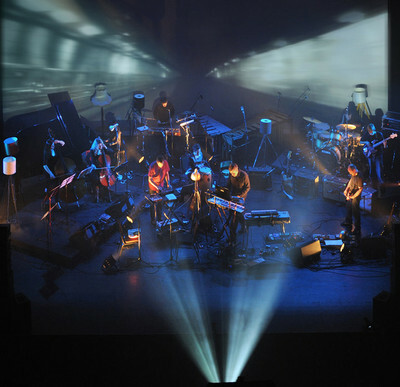 In the interim, he released a purely ambient EP, Seven Tales of the North Wind, that revealed the influence of the Nashville duo, Hammock, who remixed a Sheehan tune. He brings all those elements together on Stories from Elsewhere, an album whose signature sound may be the music box. Sheehan has custom music boxes for which he creates his own music rolls and then manipulates the resulting sounds electronically. Nowhere is that heard to better effect than on “La Boite à Musique” (Music Box). It opens with a charming music box melody that morphs into a marching rhythm, which then stutter-stops, and finally is enveloped in strings that rise like a Jupiter rocket breaking the atmosphere: slow, graceful, inevitable. There is innocence and foreboding in equal measure on Stories from Elsewhere. It begins with the cover art, a painting of a young boy alone in the forest with a toy piano or music box. But the inside cover depicts that same boy, standing alone in an abandoned, desolate village. It’s the kind of package that makes one lament the ascension of digital releases because it creates the surrounding aura of the album of an innocent world with a darker side lurking underneath. There aren’t a lot of albums that grab you like a page-turner novel and change you by the end, but Stories from Elsewhere is one. The track “Somnus” provides a heroic, ambient denouement that leaves you breathless, with the final “Lullaby Machine” tagged on to say: It’s alright. Go to sleep. It’s only a dream, isn’t it? Rhian Sheehan’s Stories from Elsewhere is a masterpiece of quietly epic dimensions. Hear Rhian Sheehan’s recent Echoes Interview in the Echoes Podcast. Sign up for Echoes CD of the Month Club. With the Echoes CD of the Month Club, you get great CDs like Rhian Sheehan’s Stories from Elsewhere Follow the link to the Echoes CD of the Month Club and see what you’ve been missing. This entry was posted on May 1, 2013 at 8:16 am and is filed under CD of the Month. You can follow any responses to this entry through the RSS 2.0 feed. You can leave a response, or trackback from your own site. A really awesome way to promote music and the artist.